May…the 5th month of the year…we are already on month number 5 – how crazy is that!? So for this month’s ‘Products Popping Up’ I have a good mix of beauty (and lifestyle) products to show you guys. ♥ Dove SA #BeautyIs Meetup – I had my meetup on Saturday and was pleasantly surprised with the turnout. I’ll be doing a blog post about it tomorrow, so keep your eyes peeled for that. ♥ Mother’s Day – the LUSH Mother’s Day collection is available online and in-store RIGHT NOW so go pick up a couple of items for mom, I’m sure she’ll appreciate it. And remember. converting your mom into a #Lushie4Life is a good thing because she’ll offer to buy something for you too next time she goes to a LUSH store (my mom-in-law & sister-in-law were my very first converts). ♥ Baby Shower – I have my sister-in-law’s baby shower coming up this coming weekend. I’m not going to go into too much details because even though she knows it’s happening on the 10th, she has no idea where it will be held / what the theme is. ♥ Birthday – it’s my little nephew’s birthday this month as well, he’s turning 2! I still need to pick up gifts for him, but I always like to get 1 fun gift (like a toy) and 1 ‘responsible’ gift (like a book or clothes) for the kids in our family. Do you usually only get fun toys for the children in your family? ♥ World Turtle Day – 23 May (just had to throw in a random too!). ♥ International Hamburger Day – 28 May (yum – will definitely have a Wimpy Cheese Burger on the 28th). Ok, so enough about what’s happening in my life – here are all the goodies that will be launching in May 2014. Clicks launched the Babyliss Curl Secret this month. The BaByliss Curl Secret has pioneering Auto Curl™ technology to effortlessly create beautiful, free-flowing curls with a long-lasting effect. Hair is automatically drawn in to the ceramic curl chamber where it is softly held and gently heated from all directions to form the perfect curl. Inside the Curl Secret, the lock of hair is turned twice, around a rotating roller on itself. The temperature is perfectly uniform. The hair is shaped super safely and very gently for silky and shiny results. Perfect conditions for a curly hairstyle that lasts, while respecting more than ever, the hair’s structure. 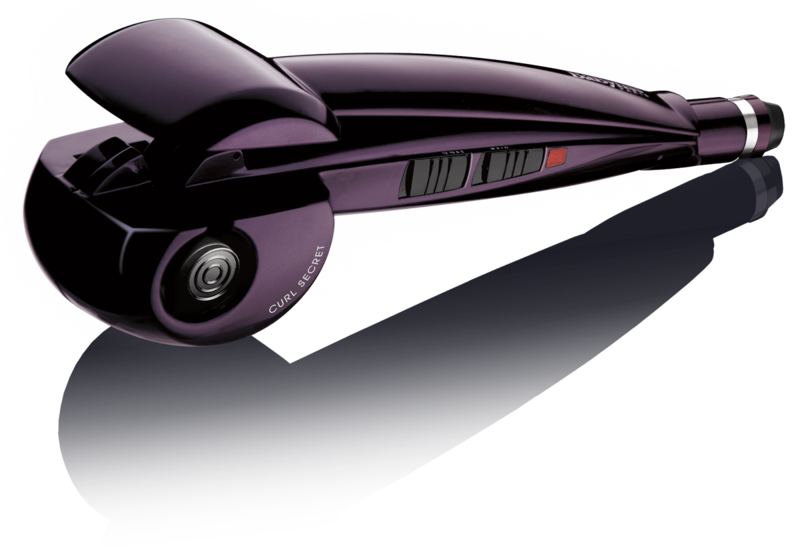 The lock of hair is automatically drawn in on the rotating element of the styler before being released in a matter of seconds. This device is perfectly safe to use, with a rotating and heating element that is entirely covered by a heat resistant shell that protects hands from contact with this heat. Ideal for mid-length to long hair, this revolutionary Babyliss Curl Secret styler can be used on all hair types, BUT should not be used on synthetic hair. In a few seconds, it creates perfect and long lasting curls. BaByliss Curl Secret Features Auto Curl™ technology, professional heating system for fast curl formation, ceramic curl chamber for smooth, shiny curls, alternating curl direction for a natural finish, automatic shut off, 2 heat settings (high and low), 3 timer settings with audio bleep indicator, heat ready indicator, 2.5m swivel cord and a heat protection mat. When I went to a Gary Rom salon a couple of weeks ago, they used a similar styler on my hair and I LOVED the soft curls it created, plus it’s probably less damaging than a curling iron too. This styler will retail for R 1499,00 (definitely on my wish list!) at selected Clicks stores nationwide. Anna-Louise has launched their Winter 2014 collection – Marilyn Monroe is famously quoted as saying she only wore Chanel No.5 to bed, Coco Chanel herself was fan of something a little more decadent. Sleeping in good quality sleepwear is one of life’s pleasures, and the pleasure of wearing a piece from the Anna-Louise Winter Collection is as luxurious as it is a la mode. The key to a perfect night’s sleep is going to bed at exactly 10pm, wearing pyjamas and enjoying a cup of tea beforehand. Anna-Louise can certainly help on the pyjama front. The whole collection can be viewed here, I am in love with the photos! The prices of the collection items can be seen here, plus the list of Anna-Louise stockists are listed here. 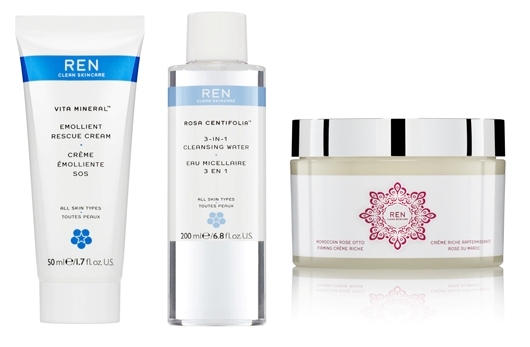 REN South Africa is launching 3 new products this month. Remember, REN products contain no parabens, mineral oils, petrolatum, synthetic fragrances, synthetic colourants, glycols, silicones or ethanolamines (carcinogenic). Rosa Centifolia Express Make-Up Remover – instantly sweeps away make up while nourishing and soothing. A gentle cleansing milk that quickly and effortlessly removes make-up including waterproof mascara from the face and delicate eye area. Leaves the face and eye contour purified, soothed and toned without tightness & is suitable for all skin types. This makeup remover will retail for R 240,00 at selected Woolworths & Foschini stores nationwide, as well as the REN SA online shop. Rosa Centifolia 3-In-1 Cleansing Water – a pharmacy-style eau micellaire suitable for even the most sensitive skin. A gentle 3-in-1 cleanser, make-up remover and toner that is suitable for the whole face and even the delicate eye area. Alcohol, soap and detergent free. Apply in the morning and / or evening to your face, eyes and lips using a cotton pad. No need to rinse. This cleansing water will retail for R 250,00 at selected Woolworths & Foschini stores nationwide, as well as the REN SA online shop. Moroccan Rose Otto Firming Crème Riche – a rich, nourishing and intensively hydrating luxurious body cream. A rich yet soufflé-light body cream that intensively hydrates and nourishes, while visibly smoothing and firming the skin. Deeply hydrates and nourishes and leaves skin feeling firmer & looking dewy smooth and soft. Contains Hydroxyproline, an amino acid that plays a key role in collagen contraction and strength to firm and plump the skin; and Hyaluronic Acid that provides long lasting hydration in the epidermis keeping the skins surface smooth. This body cream will retail for R 425,00 at selected Woolworths & Foschini stores nationwide, as well as the REN SA online shop. 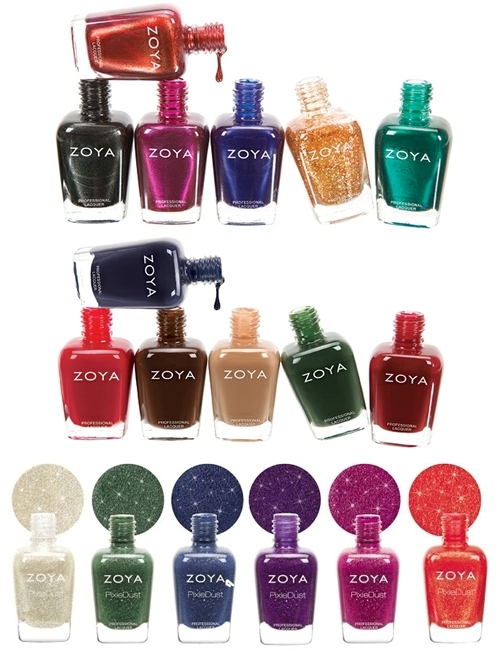 Zoya South Africa is launching 2 new collections in May – their Fall Cashmeres & Satins collection and their Fall PixieDust collection for 2013 (it’s not old stock, remember our seasonal collections are always a couple of months after the ones you see in the US / UK). Fall (Autumn) Cashmeres & Satins – this new collection feature twelve new Autumn palette shades. Cashmeres features six very Autumn-inspired cream shades and Satins features jewel-toned metallics and a gold flake top coat. This collection will retail for R 140,00 per bottle and can be purchased from Zoya South Africa. Fall (Autumn) PixieDust – this new texture polish collection contains 6 stunning jewel-toned shades that are bound to delight! Remember, all Zoya nail polishes are 5-Free (free of DBP, Toluene, Formaldehyde, Formaldehyde Resin and Camphor). PixieDust polishes retail for R 165,00 per bottle, available from Zoya South Africa. Elizabeth Arden is launching an exciting duo this month, the Ceramide Boosting 5-Minute Facial. This is a two-step, bi-weekly system that includes a luxurious Self-Foaming Mask and Replenishing Serum. The products work in harmony to treat and pamper the skin for a brighter, more even appearance. The duo is ideal for use 1-2 times per week as it helps to detoxify surface impurities and boost radiance for the ultimate flawless looking complexion. Ceramide Boosting 5-Minute Facial product formulas are suitable for all skin types and ideal for those concerned with the visible signs of aging. This at-home facial kit will retail for R 795,00 at Edgars, Truworths, Foschini and Woolworths department stores nationwide. Step 1: Self-Foaming Mask – this ultra-lightweight mask glides easily onto the skin’s surface. After just seconds, the unique formula works itself into a light foam, activating chemical and enzymatic exfoliators to gently cleanse as well as a purifying system to help detoxify surface impurities and promote skin cell turnover. Skin is left cleansed and primed for the optimal treatment benefits of the Replenishing Serum. Step 2: Replenishing Serum – the serum’s silky formula delivers Elizabeth Arden’s Ceramide Triple Complex (a combination of Ceramides 1, 3 and 6) deep into skin’s surface. A skin-identical, replenishing lipid complex, it helps reinforce skin’s protective barrier providing enhanced moisturisation and a smoother texture as it soothes sensitive skin. The serum is further enriched with Retinyl Linoleate and Tropical Fruit Extracts to help firm, strengthen and retexturize skin’s appearance. Soothing ingredients like Aloe Vera and Rice Kefiran leave skin calmed and soothed. Retail Box launched Cliniscalp at the beginning of May, a revolutionary product brought to you by Joico. Cliniscalp, is an advanced botanical thinning hair solution with Peppermint Leaf Oil, clinically proven to leave hair fuller, healthier and thicker looking. A combination of testosterone and 5 Alpha Reductase enzymes cause the formation of DHT which is responsible for thinning of hair. DHT causes the follicle to be blocked and the hair then grows out thinner and appears to be less. Cliniscalp’s 3-step daily regimen cleanses the scalp of sebum and DHT, neutralises environmental pollutants, provides essential nutrients, increases the blood circulation of the scalp and strengthens and maintaining existing hair. Cliniscalp regimens are also available in trial kits for early & advanced stages of thinning for natural & chemically treated hair. The products in this range will vary from R 260,00 to R 460,00, and the trial kits will range from R 535,00 to R 635,00 online at Retail Box. 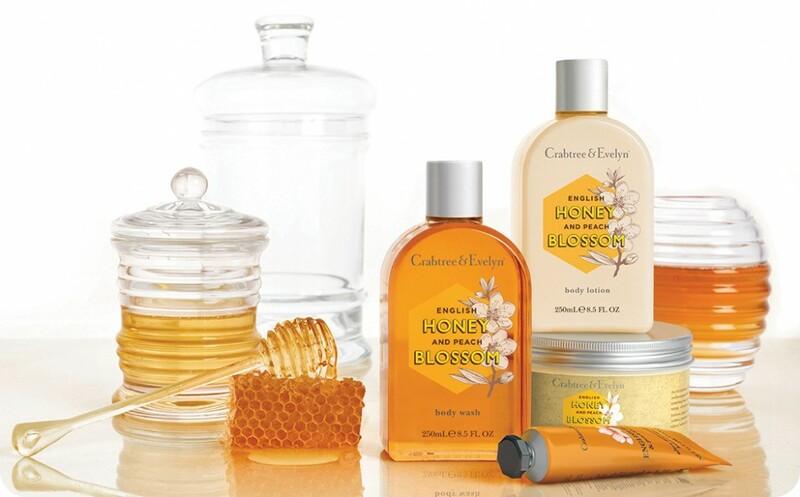 Crabtree & Evelyn is launching a new intensive skin-conditioning collection called English Honey and Peach Blossom. Crabtree & Evelyn aestheticians chose a natural extract of wild flower honey renowned for its ability to hydrate extremely dry, parched skin. As well as intensely moisturising, honey’s warm, rich scent combined with peach blossom’s velvet tones, brings a luxurious, heavenly touch to soft and supple skin. Hand Therapy – an intensive conditioning cream leaves hands feeling softer with each use. Formulated with conditioning shea butter, peach blossom extract and macadamia nut oil to moisturise and soften hands, along with myrrh to help condition cuticles and nails. This hand cream will retail for R 125,00 for 25g / R 330,00 for 100g at Crabtree & Evelyn stores in Sandton City, Hyde Park, Design Quarter, Menlyn Park, Cavendish Square, V&A Waterfront and La Lucia Mall or in the Crabtree & Evelyn online store. Body Butter – a rich body butter is formulated with conditioning peach blossom extract and moisturising honey, shea butter and moringa oil for soft and silky smooth skin. This body butter will will retail for R 650,00 at Crabtree & Evelyn stores in Sandton City, Hyde Park, Design Quarter, Menlyn Park, Cavendish Square, V&A Waterfront and La Lucia Mall or in the Crabtree & Evelyn online store. Body Wash – an intensely moisturising body wash contains conditioning peach blossom extract and moisturising honey and glycerine. This body wash will retail for R 420,00 at Crabtree & Evelyn stores in Sandton City, Hyde Park, Design Quarter, Menlyn Park, Cavendish Square, V&A Waterfront and La Lucia Mall or in the Crabtree & Evelyn online store. Body Lotion – a lightweight body lotion is formulated with conditioning peach blossom extract and moisturising shea butter and honey for soft and silky smooth skin. This body lotion will retail for R 450,00 at Crabtree & Evelyn stores in Sandton City, Hyde Park, Design Quarter, Menlyn Park, Cavendish Square, V&A Waterfront and La Lucia Mall or in the Crabtree & Evelyn online store. All Purpose Balm – this rich all-purpose balm can be used on any area of skin requiring targeted deep moisturising. Formulated with moisturising shea butter and honey, combined with skin- conditioning beeswax and peach blossom extract. The balm will retail for R 280,00 at Crabtree & Evelyn stores in Sandton City, Hyde Park, Design Quarter, Menlyn Park, Cavendish Square, V&A Waterfront and La Lucia Mall or in the Crabtree & Evelyn online store. Lip Salve – formulated with soothing and conditioning beeswax and skin conditioning honey extract. Olive fruit oil, sunflower seed oil and shea butter moisturise and condition. The lip salve will retail for R 160,00 at Crabtree & Evelyn stores in Sandton City, Hyde Park, Design Quarter, Menlyn Park, Cavendish Square, V&A Waterfront and La Lucia Mall or in the Crabtree & Evelyn online store. So that’s all I have for you this month – I have to say, I’m pretty excited about the Babyliss Curl Secret as I have waited for a very long time for something like this to come to South Africa! A great post and lovely pics! No, the Zoya nail polish I am wearing right now isn’t from this collection…it’s called Rihana (one “n”) – it’s such a stunning shade! Guuuurl, you and me both! Like I said in my blog post, I have been waiting for absolute aaaaages for this styler to come to SA!! Love these posts!!! I always find it so interesting to see what goodies will be arriving on the shelves in the stores. Keep it up, Luzanne! Thank you, Barbara – so happy you enjoy these posts! I would die for that hair curler wow!!!! The Elizabeth Arden kit looks like just the spoil I need for my birthday at the end of the month. I so love these posts! 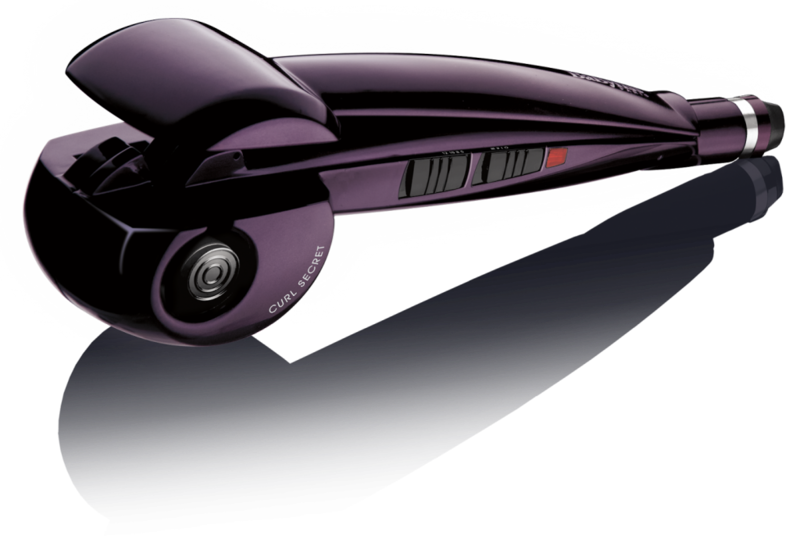 It seems a lot of you guys have developed shark eyes for the Babyliss Curl Secret…and with good reason! I, myself, want to run to the shops to get one! These posts are the best, even though I don’t live in South Africa. I really enjoy seeing what is released in your country and referencing that back to whether we have it here. I have that Babyliss styler (in another color) and it’s fabulous, so easy on the hair too. I’m so glad to hear that, Alissa! I often wonder if my international readers enjoy these blog posts. The polishes look great and the Lush Mother’s Day collection is so awesome! About to try Elizabeth Arden facial thingy,hope it’s as good as it sounds! Sounds like you have a busy month! The Babyliss Curl Secret looks so neat! I’ve seen other brands come out with something similar but I haven’t jumped on that bandwagon yet. LOL! Hahahaha! Very long queue but I hope I’m first in line as I’ve waited so long for this beauty to arrive in SA…I’m sure a lot of other ladies have also waited long for this though.